When it comes to mobile devices, all of the major chip-makers seem to be jostling to create the greatest new silicon. 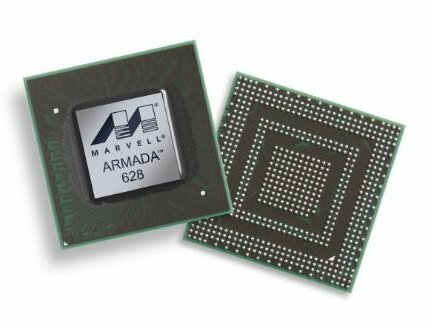 This week it's Marvell's turn to make a play for the performance crown with the all new ARMADA 628. The manufacturer is calling this chip a ‘game changer', and while that might be over-egging it a bit, the 628 is certainly shaping up to be pretty capable. The application-processor uses a three-core design based on the ARM v7 - Cortex A9 MPCore, we're guessing - architecture and clocks in at an impressive 1.5GHz. All of that power should allow the chip to show two simultaneous 1080p 3D video-streams or render 200 million triangles per second without breaking a sweat. Advanced power-saving features also mean that the chip can play back a high-def video for around ten hours "on a single charge", though the manufacturer doesn't list the capacity of the battery. What makes this chip pretty unique is the way that Marvell has chosen to use the three cores. While the first two are tuned for high-performance, the third has been optimised for low-power operation and is clocked at only 624MHz. This will allow the chip to run routine, system-level operations without needlessly spinning-up the more power-hungry cores. According to the company, this lets the 628 offer unparalleled performance as well as exceptional battery-life. Providing more than just power and longevity, the new design also claims to be the first to integrate a USB 3.0 controller. We're not sure how useful this would be on a portable device with limited storage, but it's still a nice feature to have. The ARMADA 628 is destined for tablets and smartphones and is currently being sampled to customers. This means that we could see the chip making its way into devices within the next 12 months. Advanced power-saving features also mean that the chip can play back a high-def video for around ten hours “on a single charge”, though the manufacturer doesn't list the capacity of the battery.